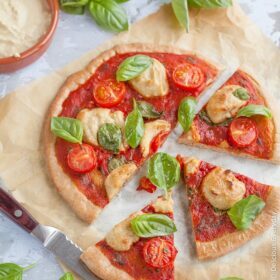 Simple, delicious, satisfying the Italian classic, Margherita Pizza, becomes vegan thanks to this cheeseless vegan pizza recipe that uses cashew ricotta in place of cheese. When I shared my hummus and tomato flatbread pizza recipe I shared my long-held love of Margherita pizza. I’ve been playing around with this vegan pizza recipe for a while now and I’m so pleased with the results. It has all the hallmarks of the classic Margherita. Fragrant basil, tart tomato, and in place of these cheese is a creamy cashew ricotta. I’ve been playing around with cashews for a long time now as they work so wonderfully as a substitute for dollops of sour cream or yoghurt and even in place of cream in pasta sauces. This cashew ricotta is no different. To mimic the umami elements of cheese, in this ricotta substitute I’ve used nutritional yeast and a little miso, along with a little olive oil for a slight buttery richness. I was a little unsure about serving my vegan pizza recipe to my hubby, who ADORES cheese, but I needn’t have worried. While he admitted he enjoyed the cheese version he happily ate my cheeseless pizza. 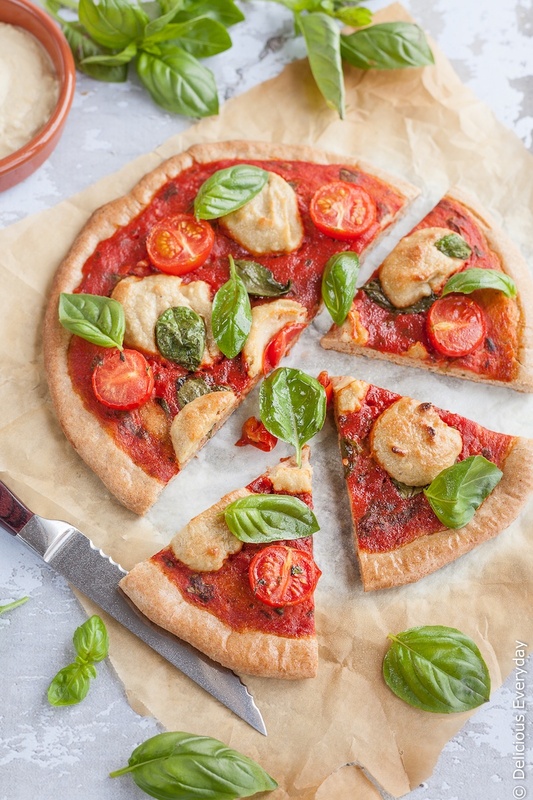 In fact, I’ve made this vegan margherita pizza several times since then while perfecting the recipe, and each time he’s been more than happy to help me make it disappear. One of the great things about this vegan pizza dough is the fact that the dough is ready after only a 30 minute proving. Homemade pizza in under an hour? Yes, please! If you’re going to make pizza at home I strongly urge you to consider purchasing a pizza stone if you don’t already have one. It makes all the difference in achieving that crispy pizza base without burning your toppings in the process! So tell me, what is your favourite pizza? First thing first preheat your oven to 240 celsius (465 Fahrenheit) and place the pizza stones on the middle rack as soon as you start the dough as this dough is ready in about 30 minutes depending on how warm or cold your room is. To make the dough place the flour and salt in the bowl of a stand mixer fitted with a dough hook. Stir well to make sure the salt is well mixed through the flower. Place 2 tbs of the water in a bowl along with the yeast and leave for 5 minutes or so until the mixture foams. Add the yeast, remaining water and olive oil to the bowl of the mixer and knead for 5 to 10 minutes, or until the dough springs back lightly when touched. Lightly grease a large bowl with a little extra olive oil and add the dough, tossing it in the oil. Cover and leave for 30 minutes or until doubled in size. While the dough does its thing make the cashew ricotta. Place all the ingredients in the bowl of a food processor and process until smooth and creamy, around 5 to 10 minutes. Scrape down the sides of the bowl occasionally to make sure you don't have any lumpy bits! For the topping combine the tomato passata with the garlic and chopped basil and salt and pepper. Cut 2 large square pieces of baking paper that are roughly 30cm (11 inches) wide. Remove the dough from the bowl, cut in half and place onto each square of baking paper. Roll each half into circles roughly 25cm (9 inches) in diameter. Leave for 5 minutes before topping. Divide the sauce and cherry tomatoes between each pizza. Add dollops of the cashew ricotta and scatter some additional basil leaves on top. Take each square of baking paper and carefully place on the preheated pizza stone. Bake each pizza for 8 to 10 minutes or until the edges of the crust are lightly golden and the base is crisp. Scatter additional basil leaves on top and add a drizzle of extra virgin olive oil and serve immediately. Delish—i used refrigerated basil from a jar and it was a perfect addition. 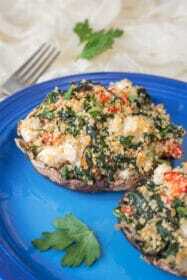 I will be making this one again not only for dinner with soup or salad but a perfect party appetizer. I love making grilled pizzas and your cashew ricotta is brilliant – must try! I am so intrigued by the idea of making cashews into ricotta! What a great idea! I am so intrigued by the cashew ricotta!!! I make my own dairy ricotta every week. But this sounds so interesting!!!! And margarita pizzas when done well are the best, aren’t they. This just looks beautiful! 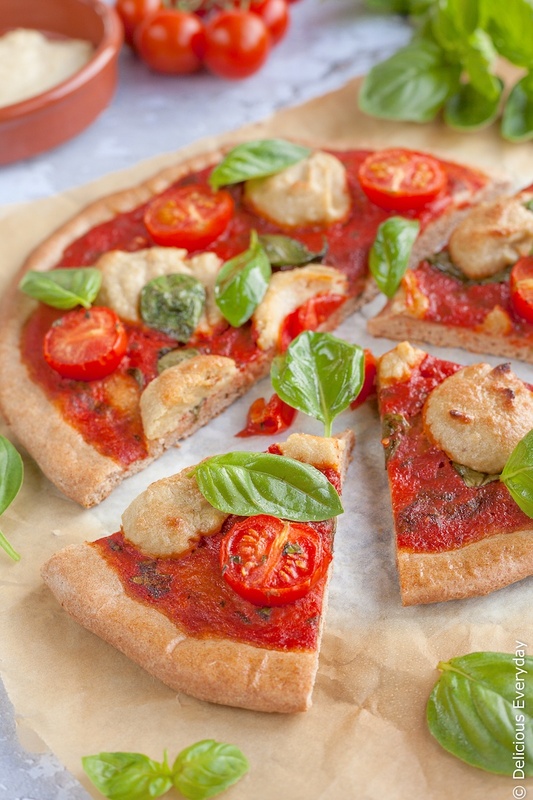 Such a great looking pizza, love that cashew ricotta cheese! Love this recipe! I love using cashews for creamy sauces and never thought of using it to make a “ricotta” cream! I will be giving this a try! Thank you!